I thought Id try a different kind of post here. This is an experiment to see if you guys like this kind of thing. If you do let me know and I will do more. We all love Big Brother! The drama, the games, the strategy all creates a captivating story and leaves us wondering what will happen next. I'm sure I'm not the only one to fantasize about playing the game or at least playing out scenarios of what might happen next in the house. That is what this post is about. Think of it like those "Choose Your Own Adventure Books" from when we were kids. I want to say this is a strictly hypothetical scenario. While there is some reason to believe this could happen it is not an official plan and in fact it looks like it will not. Victoria has won the POV which means Cody has to name a replacement to go up against Brittany. I believe now is the time to backdoor “The Beast Mode Cowboy” Caleb. Over the past few days Caleb’s jealousy and irrationality have been at an all time high. He truly believes Amber owes him and Cody is stepping on his toes. He has been moping around the house and telling everyone who will listen that Amber and Cody are throwing it in his face. He is a strong competition threat and up until now was an ally of Cody. But with his recent mindset there is no telling what he would do if he wins HOH. Lets think about who Cody is aligned with and who his options are as a replacement. Amber and Jocasta won the Battle of the Block therefore they can not be renominated. They would have been the best options to nominate opposite Brittany guaranteeing someone who would nominate Cody and his allies would be leaving. Derrick is Cody’s strongest ally he is not going up. Christine, Frankie, and Zack are his next strongest allies and not an option for replacement. Hayden along with Nicole are also allies probably not options. That leaves just two viable options Donny and Caleb. Donny is well liked by everyone in the house but not exactly trusted. He's secretly aligned with Derrick and Frankie in Team America. Jocasta is a solid ally of Donny as well. If he gets nominated against Brittany he probably stays. If they decided they want Brittany gone, and it looks like that, this will be their play. But what if they want to make another power move and get Caleb out? Here is how I would do it. First you tell him if Donny goes up Brittany stays and she will be coming after them. That means one of us has to go up. Then you build up Caleb’s ego saying he is the only one mentally strong enough to not crack under the pressure of the block. Tell him to imagine Zack or Frankie up there. There is also the added benefit out keeping Brittany quite thinking she is safe now. Tell him he will not go home over her because they have the votes. You say we had you last week we will have you again. Will he buy this? I think he might but even if he does not he can't stop you. Why do I think this the best plan? Well you can get out two people this week. Caleb - A huge physical threat who is an ally now but becoming more unhinged everyday. Brittany - A paranoid loner in the house who you finally might be able to convince you have her back after saving her a second time. Yes get him out, he's been playing the psycho card and needs to go. Yes get Caleb out! Perfect time! Yes, to the article and BDing Caleb!! Yes! Get rid of #beastmodestalker now! Plus, this fulfills America's Teams quest for the week. Please don't tell me they think they've already fulfilled this challenge! Caleb is an egotistical creep. Get him out now! They actually have completed the mission with putting up Amber. It was a very easy one since it was very open to who they perceived to be a physical threat. He's gotta go I mean he's almost as bad as Devin! I like these and I do think they should backdoor Caleb. He is as paranoid and especially about Cody. 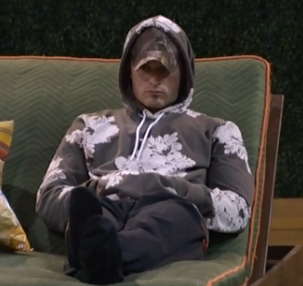 If he wins HOH next week he could easily try and get Cody out of the house. They have to make sure they have the votes without him because if one of the outsiders wins HOH one of the guys could go home. It's a risk but I think it's worth it's worth they may not get a chance again. I'm glad you like the blog! That is a great point about the votes and the risk. That actually seems to be the only reason why they don't want to do it now. Love these!! Yes, they should backdoor Caleb. I actually want Derrick out he thinks he has this game all sewn up. I hate when they get Arrogant. I agree. Getting Caleb out SHOULD be their next move since he's insane and unpredictable. It's so obvious. My wife and I have been floored that this has not been the direction they have decided to pursue. Love these post. However, I think Caleb should stay a few more weeks. He's a good jury vote for the guys. You know thats a good point but Im not sure. He seems like that type that could hold a grudge about how he is evicted. He almost certainly has to be a backdoor or a double eviction blindside eviction. He probably will not hold a grudge though since "most" take it as just a game. I like these posts. Fun seeing how others are thinking. I say keep Caleb at least for a jury vote.If Brit or Victoria win hoh,bthings will be really interesting. I wish they could talk Vic into staying on the block as a pawn and then vote her out Thursday. Yes Caleb needs to go! I like your article. I think this is a great opportunity to get the cowboy out. He doesn't deserve to win. This is big brother not the Bachelor. It's time to backdoor him so he can go sign up for the Bachelor :).